Who should use powerline networking? Everyone talks about Wi-Fi and cellular… but what if those aren’t an option? You don’t have to go to the expense of running network cables all over your house just because your Wi-Fi signal isn’t great. There’s another option: powerline networking. Powerline networking uses the copper wires in your home to send and receive data. It’s a pretty smart idea, and although the first-generation powerline adapters were slow, today’s models are faster than Wi-Fi in most cases and faster than cellular in almost all cases. The technology relies on something called “the skin effect” — in a copper wire, the voltage goes through the center of the wire and the signal stays on the outer skin. That way, changes in the signal really don’t have a major effect on the voltage being carried. So, adding data to your home’s internal power grid isn’t going to harm anything else. Installing a powerline networking system is easy. 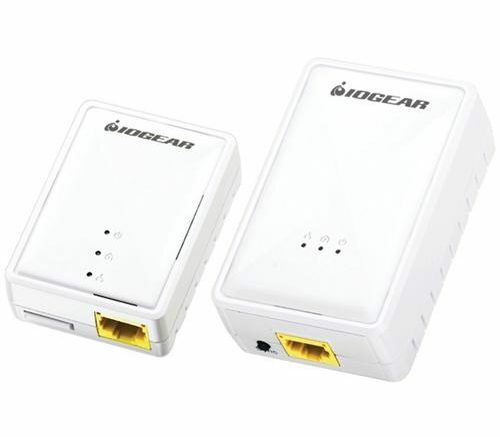 Plug one of the two adapters near an existing router or switch, and plug the other one where you need networking. From there, run an ethernet cable to a new switch, to the device that needs networking, or to a wireless access point. There’s no setup and there’s really nothing to it. People with a single junction box in their homes. Powerline networking relies on signals crossing from one circuit breaker to another, which means that all your circuits need to be in the same box and share the same backplane. If you only have one breaker box, you’re probably all set. Compact fluorescent bulbs have a negative effect on powerline networking because they can send noise back down the line which interferes with the powerline networking signal. If you have changed over to LEDs, or if you’re still mostly on incandescents, you’ll have better results with powerline networking. You may not know what your in-wall wiring looks like, but if you have an attic or garage, you may be able to get some idea. Having a lot of metal in the walls can disrupt Wi-Fi signals and sincerely limit their range. Most routers can send a signal 200 feet in open air, but they may not be able to reach across three rooms if there’s a lot of metal between the router and the room you’re in. As much as Netflix likes to tout its 4K service, in practice it’s nearly impossible to get 4K using Wi-Fi. You need a very smooth stream with practically no interruptions, and it needs to be at least 25Mbps — the faster the better. Although it’s easy to get a connection that peaks out at 25Mbps or higher, getting a smooth stream at that speed is going to be hard for most routers to accomplish. On the other hand, it should be possible to get at least 80% of your top internet speed with a powerline network. You do lose something with the translation to power lines and back, but it’s nowhere near as much as you would lose with Wi-Fi. Netflix’s 4K presentation isn’t that great, but with powerline networking you have the best chance of getting the best quality they offer. The best news about powerline networking is that it isn’t expensive. When you take a look at the options available at SolidSignal.com, you’ll find everything you need at a great price! Is there a limit to Wi-Fi range?